⬅ Can We Keep It Real? ... and Why That's a Good Thing! Have you ever had — or do you have now — a boss or a teacher or a family member that you just can’t please? No matter what you do, it’s never enough. You can’t ever seem to meet their standards or make them happy. It feels like you’re always falling short, messing up, making mistakes. If you feel that way about yourself (I know I have — sometimes I still do), it’s easy to project those feelings onto others. You’re sure others see you the way you see you. And you begin to think that’s how God sees you, too. The NIV says, “He knows how we are formed…” He is, after all, not only our Father, but our Creator. 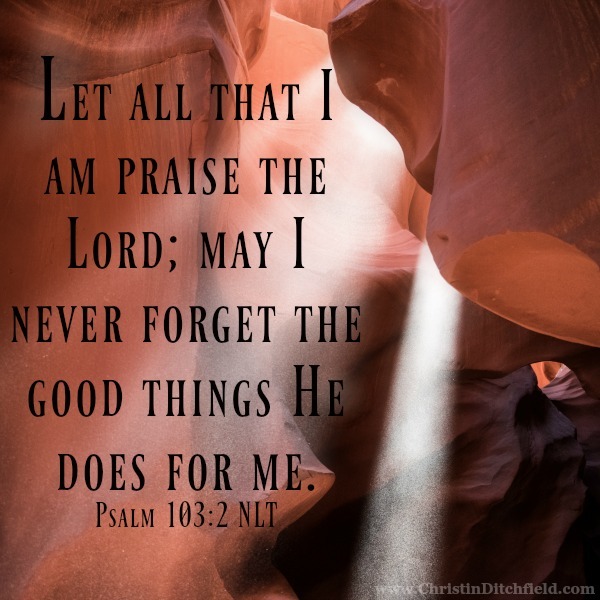 The Amplified Version puts it this way: “For He knows our frame, He [earnestly] remembers and imprints [on His heart] that we are dust” (Psalm 103:14 AMPC). God is not surprised or disappointed when we fall or fail — even if we are. Nope, not Him. Not one little bit. He knows. He sees. He understands. He even sympathizes (Hebrews 4:15). We may be a hot mess sometimes, but we’re His mess. He never berates us for our failures or mistakes. God doesn’t browbeat us over our sins. We don’t have to live in guilt and fear, dreading to disappoint Him. 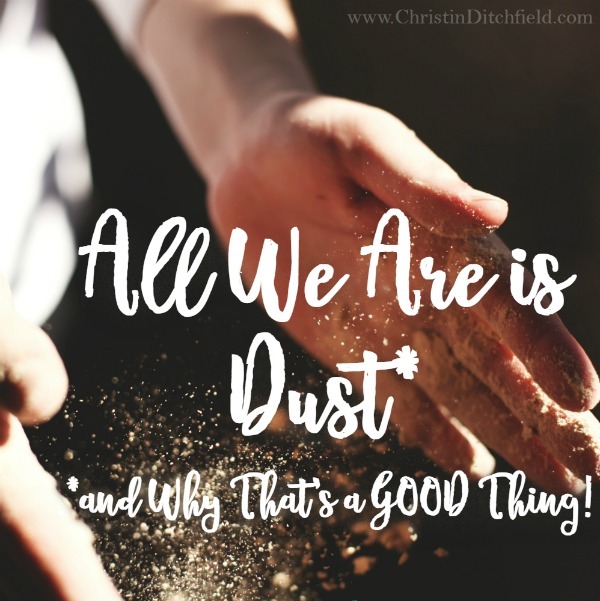 He remembers that we are dust… and so much more. We are the precious children He sent His Son to die for. And so He has compassion on us. If we’ll turn to Him in our distress, we’ll find that like the father of the Prodigal, He is always ready — ready to come running — to forgive, heal, and restore. 1) Soaking in the Psalms ~ Savor 3 Psalms this week (because one of them is reaaallly long!). This week’s Psalms are Psalm 103, 116, and 119. 2) Surfing through the Psalms ~ Read through the entire book of Psalms during our six-week study. This week, read Psalms 101-125. (which includes the “Soaking” Psalms — see above). This week’s verse is Psalm 103:2 NLT ~ It’s in the graphic below and on our VBS Pinterest board. PLEASE NOTE: If you’ve fallen behind in our study, that makes you so very… human! So totally… normal. Please do NOT beat yourself up about it. Summer Bible studies are notoriously difficult to keep up with, what with vacations, reunions, graduations, weddings, missions trips, crazy schedules and all. But we still try — because it’s fun and it’s worth it. And when it comes to spending time in the Word and with our sisters in Christ, some is ALWAYS better than none! We have two weeks left. Just enjoy them. Do what you can. Don’t worry about getting caught up… the past posts will always be on our Archive page if you want to revisit them, but don’t stress. Rest in that freedom today. Go to our Virtual VBS Archive Page and find a Summer in the Psalms blog post or an image from one of our blog posts that has been meaningful to you, one that you think would bless others. Share it on Facebook or Pinterest or Instagram with the hashtag #VirtualVBS. Go to my author page on Facebook, where you’ll see a pinned post: What We’ve Been Learning in our Summer in the Psalms and comment something like: “Love Psalm 63 — I shared it on Facebook” – so I know where to look to verify your entry. Grand Prize: a Coloring the Psalms coloring book, a copy of my latest book What Women Should Know About Letting It Go: Breaking Free from Guilt, Discouragement, and Defeat, and a beautiful leather bookmark with a verse from Psalms. Additional Prizes: a copy of Dwelling Places by Lucinda Secrest McDowell, several lovely leather bookmarks featuring Psalms, a fridge magnet that holds cards with Bible verses from Psalms (cards included)… You have until midnight EST on Wednesday July 20th.